Discussion in 'Game Discussion' started by Beau_Albert, Sep 14, 2018. @Beau_Albert twist ur arm to join us if free? andyo450, marty and Rolz like this. Guys we are going to change up the raceononz ACC servers, thanks to Rolz for setting up 2. There will be one server with a password and no restrictions. This you need to search the server name for it to come up, just search raceonoz and it should show with the password being "ROOZ"
The other server will have restriction of needing 3 track medals and SA 50 atm. To get 3 track medals you need to run 4 clean reasonable pace laps at the track in possibly any session but hotlap. Cant run off track and needs to maintain reasonable control, this just makes sure people in the server at least know the track. Anyone here should easily be able to manage this but let us know if your struggling. The SA or safety rating is built up over time driving with traffic, I really dont know what number to set this at atm with the rating reset at build 0.7 so if any people interested in racing ACC here let and us know what rating your at and we can try lower this initially then find a level later on that works well for good public racing. In order to get an SA rating you first need to get 50+ in all other catergories. If there arent many in mp it is easier to do this racing AI, just try to minimize contact, run fairly close and avoid excessive off tracks. jlynn777, Spidey_11, Mat Nipperess and 2 others like this. So, which server for tonight? the one we can get the most on i guess? andyo450 and marty like this. I think probably the password one unless everyone interested here lets us know their track medals and SA rating so we can adjust this to also keep it open to new users not on the forum. 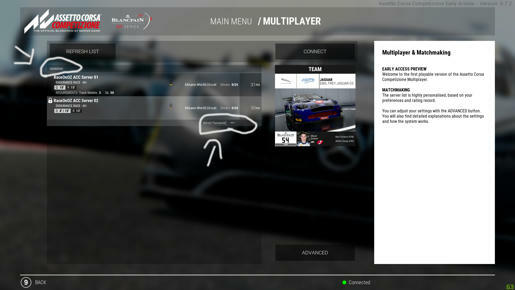 Ideally it would be better to have a public server to also find some new members that stumble across the server but if the racing in there is crap its not going to encourage too many new people to join. Early on many havent found the ratings they will eventually get to so the password server will help everyone here at least be able to get in. We will be on discord so can work put and adjust servers as needed. andyo450, Spidey_11 and Rolz like this. A heads up for anyone that wants to join the passworded server, you need to search for raceonoz as private servers arent shown by default. Then there is a small password box bottom right where you need to input "ROOZ"
Thanks guys for the racing tonight, some good battles in there and I think numbers will grow fairly quick post release in ACC as its pretty good fun I think already. Server wise I figured out the rain and so made both servers a bit randomized and they may get rain at times, was one line in our config files in the wrong place. These have changed a few times but steam wasn't picking up changes for me until I did a full reinstall of the game. Server 1 is open with SA 40 and track medals 3 for entry, with practice 20 qualy 10 and race 20. Server 2 is pass worded "ROOZ" but no other restrictions currently same session lengths at Misano. These servers can be changed up if there are any requests. The restricted entry one means you need to get at least 50 rating in each area until you unlock SA. I think the other ratings already get calculated ingame before they unlock so all your laps should help this out. The track medal you can see TR rating in your driver profile and just need this at 3 for that particular track. This is just 4 clean laps with no major control loss, off tracks and at reasonable pace. The SA rating needs some racing in traffic, this can be MP or with AI and rates how clean you are. We will set this at 30 to start with but once all here raise their rating a bit we can up this if needed, depending on how clean the new joiners end up being. andyo450, Mat Nipperess, jlynn777 and 1 other person like this. andyo450, marty, jlynn777 and 1 other person like this. andyo450, Godzilla, Rolz and 1 other person like this. Mat Nipperess, Peter Wise, andyo450 and 1 other person like this. Tried out a Euro server last night and had heaps of fun! Anyone up for joining me for an Aussie invasion tonight? I wasn’t the fastest, but certainly wasn’t last... great fun! !